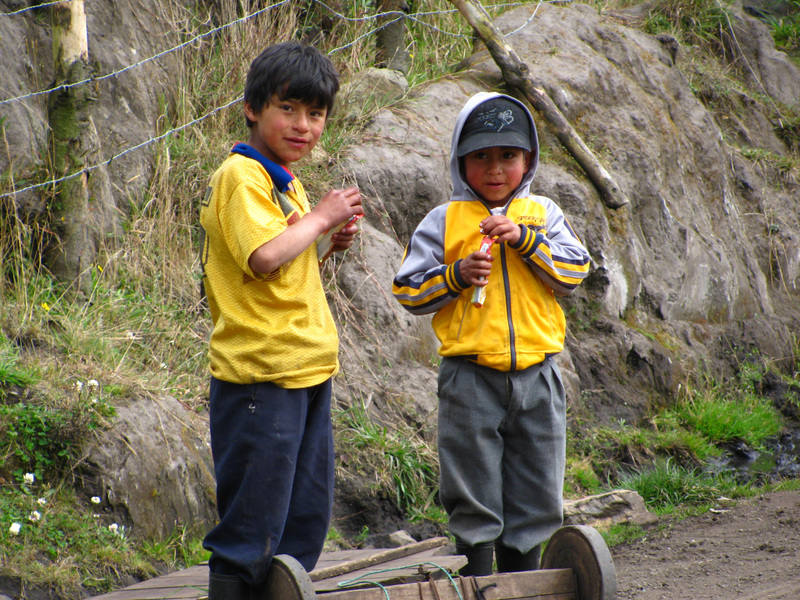 I have learned much from my travels in Latin America but it was during my two years in Peace Corps that I came to appreciate a fascinating dynamic common among people living in poverty. Perhaps because many have so few choices, they bring an amazing level of creativity to everyday challenges. Particularly the kinds of challenges most of us in the “developed” world handle with a credit card, these guys face on their own. What’s one to do when there’s no money and the same “western” needs and desires arise? Gotta get creative, that’s what. After spending three years living among “the world’s poor,” I discovered a second characteristic common among these diverse peoples – a deep capacity to get by with little or nothing. So they have this powerful combination of not needing so much and creatively using whatever they have at hand to solve the pressing needs of the day. 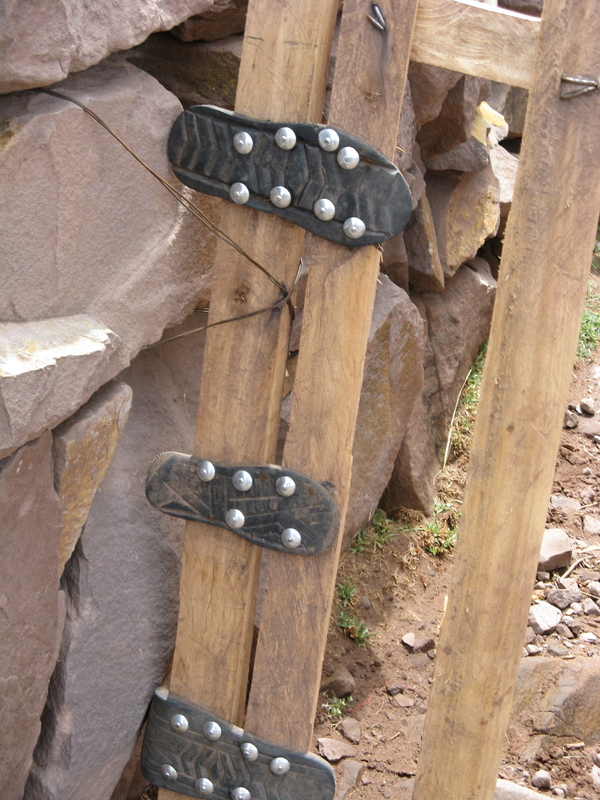 This garden gate in Peru is an example of putting what most of us in the west would consider trash, to good use. I was to find many more examples in the months ahead. 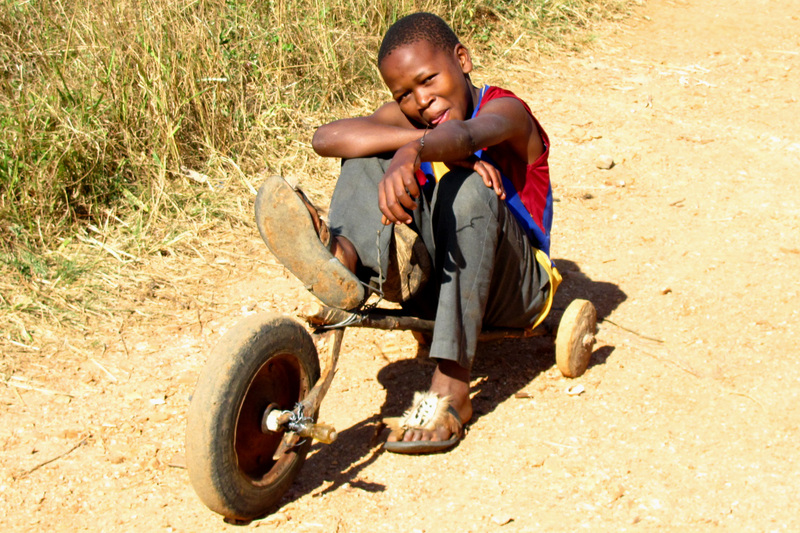 When the neighborhood boys tire of steering their toy cars around and want something to ride, they build what in my day, would be called a go-cart. 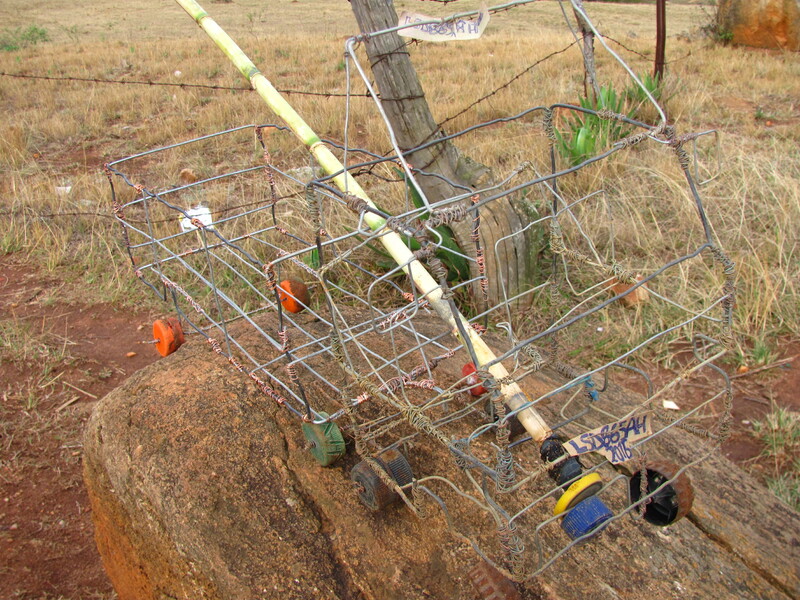 Where I used scrap store-bought lumber from one of my brother’s building projects, old lawnmower wheels and steel bars bought for a couple of bucks at Western Auto, these boys use tree branches, seats from discarded chairs and whatever else they can find in the trash or the nearby forests. No lawns or mowers here and certainly no money for a boy’s go-cart. Check out their creations. I looked beyond the children to their parents who like fully half of those living in today’s world, were struggling to live on less than $2.50 a day. Here I found this creative genius had matured. Now it was being expressed in providing food and shelter for growing families – still drawing heavily on the materials that nature provides. I saw it in the traditional building methods and materials – bamboo, open walls and waxy palm leaves for roofs in the jungles of Peru. Rocks, mud and stiff grasses in the frosty Andes. 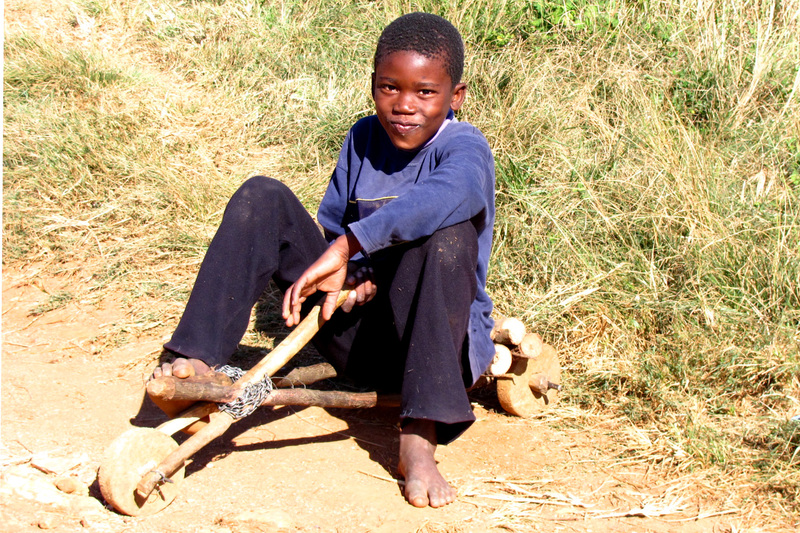 In Swaziland, a traditional home has walls made of sticks, rocks and mud with a thatched straw roof. 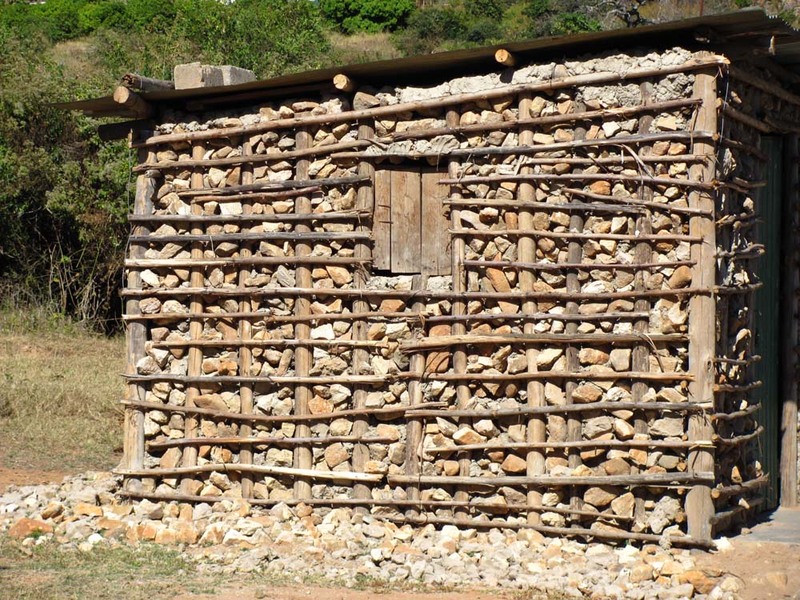 With the introduction of metal roofing and cement, these sticks and rock dwellings became more durable, their lifespan extended, and their level of security increased. Here’s one such building, the best of its kind that I have seen. It was built to house a neighborhood care point in the community where Jordan and I lived during our first months of PC training. As you can see, it’s constructed from materials that are close at hand and free for the taking. 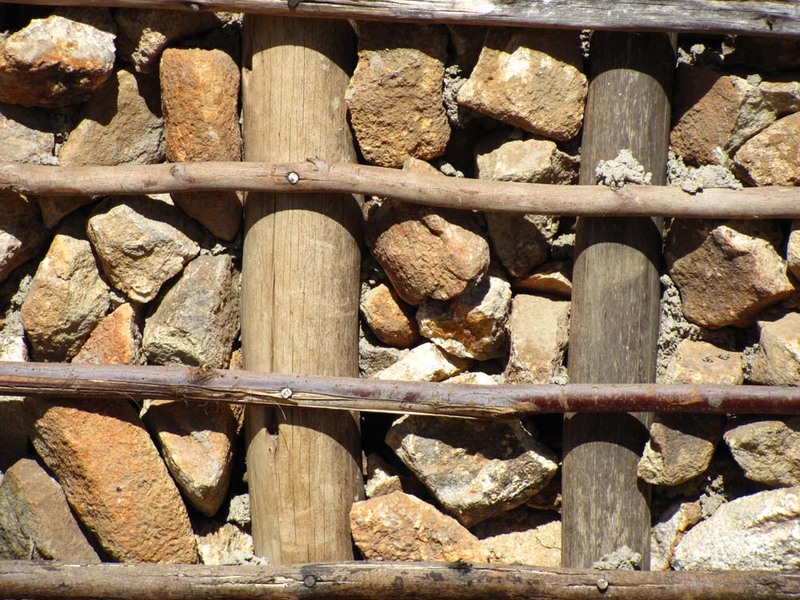 At some point, mud will fill the gaps in the rocks and a covering of cement will make the walls resistant to powerful summer rains. All that was purchased was some sheets of metal roofing, a handful of nails, a couple of hinges, a latch, a lock and a few of bags of cement – less than $200US total. Not bad for a structure that will bring on-going NGO support allowing vulnerable children to have a hot meal each day and pre-school education for years to come. Talk about good long-term return on a short-term investment! 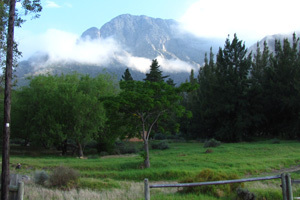 The road ahead: I am currently sitting and serving in a beautiful Vipassana meditation center just outside of Worcester, a small city 90 minutes north of Cape Town, South Africa. The center rests in a green valley surrounded by tall mountains, dotted with lakes and farms and bordered on one side by a wildlife preserve. Hearing lions roar at night and watching elephants and other wild critters move through their day may not be what one usually associates with a meditation center. Welcome to Africa! Here’s one of my views. While I am committed to staying at the center as a “long-term server” at least until the end of May of next year, I may very well stay longer. It feels like a nice place to settle with Jordan once she finishes her PC service. By that time, I will have many months of experience living and working here so, we can cross that bridge when we come to it, as they say. At some point Jordan and I still hope to travel to India and Nepal to sit and serve at retreat centers there at least for several months, maybe longer. Wherever we may find ourselves, we will draw from our Peace Corps training and experience living in a poor rural community, and seeking out situations where a little money can make a meaningful impact. Following the golden rule of sustainable development, “help first those who have found a way to help themselves,” we expect to frequently be in a position to make a few dollars go a long way. Flowing Dharma will be the financial vehicle for this aspect of our work. In the coming years, along with other development projects, Jordan and I will seek out organizations that are already doing a good job of sharing the Buddha’s teachings, in whatever tradition, with those living in their community. We plan to carefully and strategically place a few dollars in the hands of those already making these teachings available to anyone regardless of financial standing. From our perspective, this is an excellent example of sustainable community development. As one’s mind and heart are cleared of greed, hatred and delusion, new and varied possibilities present themselves that otherwise would have remained obscured. Possibilities arise for income generation, food production, home security, education, and health maintenance. Living in peace and dignity may not require wealth but I suspect it does require a level of mental and spiritual clarity – the very qualities cultivated through disciplined meditation practice. Flowing Dharma is an organization committed to helping people find a path to clarity of mind and heart, whether in Tampa Bay or in a developing country. Thank you, and may God continue to bless and keep you and yours safe, peaceful and prosperous during these challenging times. You are currently browsing the Twogoingforth's Weblog blog archives for September, 2011.